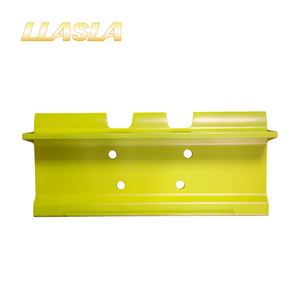 Liaoan Machinery bulldozer grouser track pad Product name Single grouser track shoe Model No. provide a variety of track shoe options to meet the requirements of your work environment. 3: What about the delivery time9 A: 15 days after receiving the down . The bolt-on pads work if your steel pads have pre-drilled holes. The clip-on pads use clips that wrap around the pad and work with most styles of pads. The Roadliner pads bolt directly to the chain so there is no triple-grouser shoe involved. and models: (If you can't find what you are looking for in the list, please feel free to contact us. MX8 SE200 SE210 SE280 MX292 SE350 SUMITOMO SH70 SH100 SH120 SH160 SH200 SH280 SH300 SH340 All manufacturers' names, numbers, symbols&descriptions are used for reference purposes only, and it is not implied that any part listed is the product of these manufacturers. 4. We have more track shoes for your reference: If you are interested in our products, pls contact with me freely. Kaito is more than capable of providing its customers domestically and foreign with replacement parts for a variety of different brands. At Kaito Construction Machinery, we believe that developing and manufacturing quality , industry- leading products to be of our top priority . Our clients spread all over China and exported to various countries and regions such as South Korea , Russia , USA , Spain , Malaysia , India and various others. 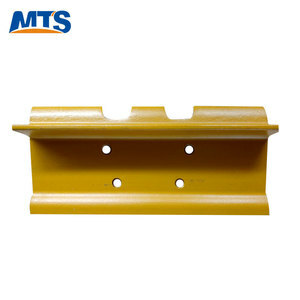 D6D Bulldozer Track Shoe Track Pads for CAT 1.Product basic details Model No. : dozer D6D track shoe Application: Excavator Price: FOB Xiamen,China MOQ: 100PCS Delivery Time: Within 25 Days After Contracted Material: 45MnB / 40SiMnTi Range: Pitch from 135mm to 228mm Warranty Time: 1800-2000 Hours 2.Product Design/Structure: 3.Models list for reference: SECTION (UNIT: mm) WEIGHT A B C SHOE PICH CHAIN PICTH (Kg/m) IS1 6.0 20.0 154.0 135.0 135.0 10.9 IS2 9.0 27.0 163.0 140.0 140.0 17.3 IS6/2 10.0 32.0 186.0 156.0 159.7:160 22.7 IS24/2 12.0 38.0 219.0 190.0 190.0 32.6 IS25 8.0 26.0 145.0 125.0 125.0 13.4 IS32/3 11.0 36.0 199.0 170.0 168:176 26.7 IS35 9.5 34.5 199.0 170.0 168:176 25.6 IS40 16.5 47.0 253.0 216.0 216.0 48.5 IS41/2 10.0 36.0 219.0 190.0 190.0 28.2 IS48 30.0 60.0 266.0 228.6 228.6 70.1 IS49 11.0 42.0 232.5 206.0 203.2 35.9 IS53 6.0 26.0 165.5 157.0 159.7:160 14.3 IS58 8.5 34.5 219.0 190.0 190.0 25.6 IS59 11.0 37.0 232.5 204.7 203.2 33.7 IS69 13.0 44.0 232.5 206.0 203.2 39.4 Pitch 228mm, single grouser track pad for bulldozer: 1) D8H, D8K, D8L, D8N 2) D120A, D135A, D150A, D155, D275 Pitch 135mm, triple grouser track shoe for excavator: 1 ) Pc40r, pc45, pc60, pc60u 2)Ex45, ex40 3) K903, k903a, k903b, k903c Pitch 190mm, triple grouser track pad for excavator: 1) Kota:HD900 2) Kobelco:K909, SK150LC, SK160LC, SK200, SK210, SK220LC 3) PC150, PC180, PC200, PC210, PC220, PC230, PC240 4) Liebherr:R902LC R912HDSL, R922HDSL, R932HDS 5) 219, 225, 315, 317, 318, 320, 322, E200B, E240, E330 6) EX200, EX210H, EX220 Pitch 216mm, triple grouser track shoe for excavator: 1) Kato:Hd1500, hd1800, hd1880 2) Kobelco:Sk300, sk400, k914, k916 3) Pc300, pc350, pc360, pc400, pc450 4) Liebherr:Hs841, hs842, hs850, r952, r954, r961, r962, r965, r971 5) Mitsubishi:Ms350, ms380, ms450, cat:235, 330, e450 6) Ex400, uh14, uh16, uh171, uh172, uh181 7) Hyundai:R350, r420, r450lc 8) Hyundai:R200LC, R210LC 9) JCB:JS200, JS220 10) Mitsubishi:MS160L, MS230, MS240, MS270, MS280, MS300 Pitch 171mm, single grouser track pad for bulldozer: D4D, D4E, D4H, D5C, D5M, D6, D6B, 561B, 561C, 561D, 561H, 933, 939, 935, 941, 943 Pitch 203mm, single grouser track shoe for bulldozer 1)D6C, D6D, D6E, D6G, D6H, D6R, D7, D7C, D7D, D8, D8D, D8E, D8G 2) D60A, D60E, D60F, D60P, D60S, D65A, D65E, D65P, D65S, D68E, D68P, D75A Pitch 216mm, single grouser track pad for bulldozer: 1)D7E, D7F, D7G, D7H 2) D60A, D60E, D60F, D60P, D60S, D65A, D65E, D65P, D65S, D68E, D68P, D75A Our products are according to the standard of OEM to manufacture. 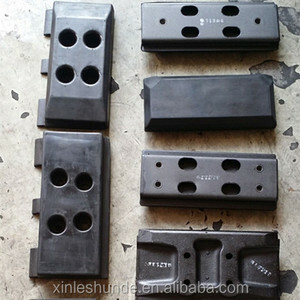 Bulldozer track pads D4H double grouser track shoes for sale The track group with shoes , which is also called track shoe plate, ttrack shoe assy, is one part of undercarriage parts for crawler heavy equipments such as excavator, bulldozer, crane, drilling machine etc. 2.The surface hardness of the track group with shoes is HRC50-60 for reduced wear and longer life, adding value to your products further to your business by maximizing durability of your products. 3. 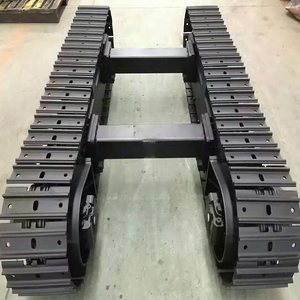 The track group with shoes have precise design, carefully manufactured for proper fix easy grousering heavy loaded capacity up to 50tons without compromising proper functioning of the excavators reliable quality, high cost performance,quality services. Shandong GT International Trading Co., Ltd.
Quanzhou Xuli Machinery Co., Ltd.
Track links are forged,quenched and tempered. Deep hardened pins for best resistance to wear and fatigue. Track shoes heat treated for proper thoughness and wear resistance. Jining Yadong Construction Machinery Co., Ltd.
We follow the management philosophy of "high-tech, high-efficiency, high-quality, serious and pragmatic". Our company is willing to work with friends from home and abroad in good faith. We sincerely hope to cooperate with clients from all over the world on the basis of mutual benefits. Other Keyword excavator rubber track, rubber pad, track rubber pad Other Brand For hitaSH , Kobelco , sumitomo , Hyundai , Daewoo , Kotmasu , shantui , volvo , kato , bobcat , ihi etc. EG08 Hydraulic Parts: Hydraulic main pump, gear pump, swing motor, travel motor, final drive assy, swing device unit, main control valve, hydraulic spare parts, final drive parts, swing motor parts. 2. By the way ,We have very good price for the EG08 Travel motor(Final drive) , Hydraulic pump , Excavator cabin , Rubber tracks , Undercarriage parts , Engine parts etc . Dalian Zhaohua Construction & Machinery Co., Ltd.
Jining Yuanyang Construction Machinery Co., Ltd.
Quanzhou Global Machinery Co., Ltd.
Quanzhou Quanyu Machinery Co., Ltd.
Jining Jinniu Machine Engineering Co., Ltd.
2. 30% TT in advance and the balance against the B / L copy 3. irrevocable letter of credit at sight 4.Western Union Lead time Within 7 -15 days after receiving the deposit Shipment port Qingdao port Packaging & Shipping B: Payment 1.100%TT in advance. It also has four sub-factories , producing bottom and top rollers, idlers, sprockets, tension springs, links,cutting edge ,end bit and steel casting parts ,OEM for big whole machinery factories at home and abroad. We always adhere to the policy of "taking the science and technology as the forerunner, taking the quality as the core and taking the highly skilled staff as guarantee" to provide our customers with qualified products and excellent services. Quanzhou Red Hill Engineering And Machinery Co., Ltd.
Design, selection of material, heat treatment, machining through a long term experience will be pivotal points to distinguish our products with others. Our main products are Track Roller, Top Roller, Sprocket , Idler, Track Shoe for various types of excavator and bulldozer , and all other kinds of spare parts like pin, bushing, high-strength bolt & nut, Link Bucket, Cylinder, Piston, etc . Differential heat treatment is also introduced on selected items,resulting in sprocket and chain longer wear life. 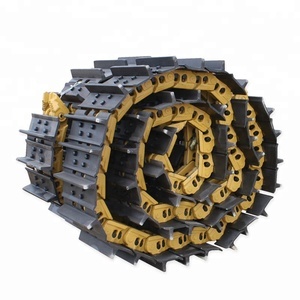 Alibaba.com offers 1,300 bulldozer track pad products. About 81% of these are construction machinery parts, 4% are other rubber products. 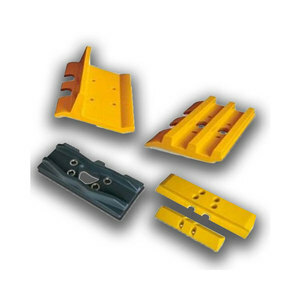 A wide variety of bulldozer track pad options are available to you, such as free samples. 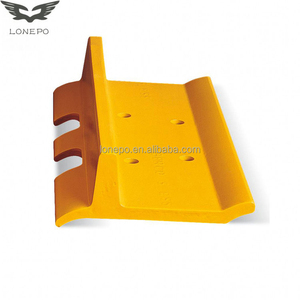 There are 1,228 bulldozer track pad suppliers, mainly located in Asia. 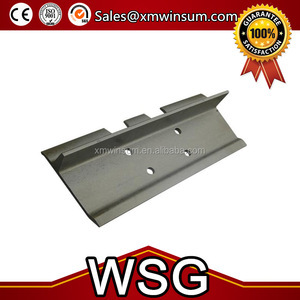 The top supplying countries are China (Mainland), Singapore, and United States, which supply 99%, 1%, and 1% of bulldozer track pad respectively. 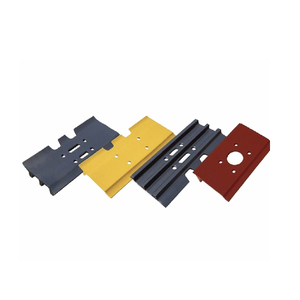 Bulldozer track pad products are most popular in Southeast Asia, Domestic Market, and Africa. You can ensure product safety by selecting from certified suppliers, including 428 with ISO9001, 206 with Other, and 4 with ISO10012 certification.